Ribeiro Jiu Jitsu Santee - Outliers is a Martial Arts School offering Brazilian Jiu-jitsu & Jiu-Jitsu (Jujutsu/Jujitsu) classes in Santee, CA for kids, men and women. 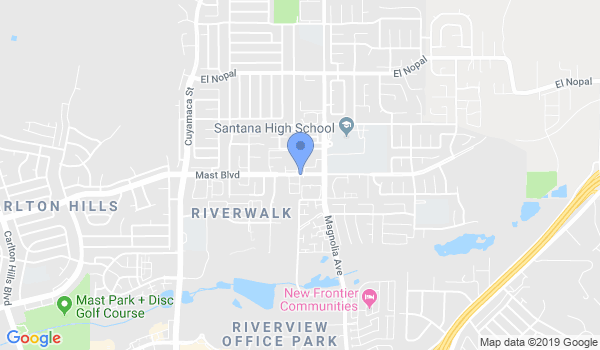 Ribeiro Jiu Jitsu Santee - Outliers is Located at 10251 Mast Blvd..
View a Location Map, get Directions, Contact Ribeiro Jiu Jitsu Santee - Outliers or view program details below. If you are a student at this school, help your local Martial Arts Community by writing a Review of Ribeiro Jiu Jitsu Santee - Outliers. You can also help your school by sharing it on Facebook, Twitter, Google+, Pinterest etc. At Outliers Jiu-Jitsu, the technical class is the heart of the curriculum, where the fundamental technique of the day is taught. During class time, a Ribeiro Jiu-Jitsu qualified instructor presents and drills the essential technique of the day. In addition to instruction and drills, the class includes time to practice and time for sparring. It's the process of instruction, drilling, practicing and sparring that builds a solid foundation in understanding the fundamentals of Jiu-Jitsu. The technical class offers the new white belt the opportunity to learn the technique in a manner that builds a solid core of skills and for the veteran belts the opportunity to improve their technique by correcting bad habits or reinforcing skills they already have. Open Mat is Friday from 6-7pm and Saturday from 11-Noon. There is also a kids class Saturday mornings from 10-11am. Would you like more information on hours, classes and programs available at Ribeiro Jiu Jitsu Santee - Outliers? Please contact the school with your questions. Update the details, Write a Review or Report Error of Ribeiro Jiu Jitsu Santee - Outliers. View all Dojo in Santee or in Zip code 92071.